Wine has carbs in it, right? 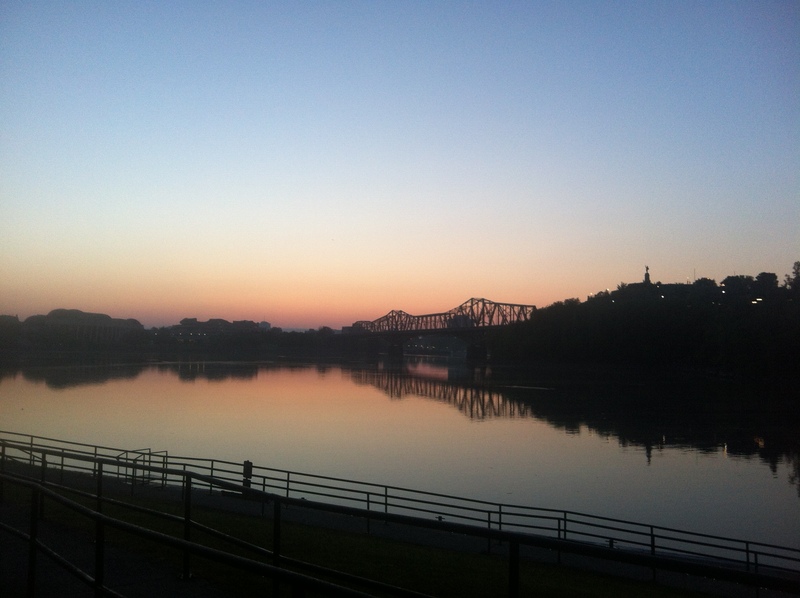 Today I boarded the train and made my way to Ottawa1 – day one of my Ottawa Marathon weekend. The train ride was great2. I spent the bulk of it working – reviewing and commenting on a report, and prepping notes for a course that I’ll be helping to teach in June – the week after the Annual Meeting of the Statistical Society of Canada. The rest of the train ride included staring out the window as the train cut its way across Ontario. After arriving in Ottawa, I met up with Mark – who will also be running the marathon on Sunday – and we made our way to our schwanky hotel for the weekend. Following check-in, we wandered to the ByWard Market for some good old time-y carbo-loading. Translation: french fries and beer. Verdict: carbo-licious. After sufficiently stuffing our faces with carbs, we wandered the market some more and then decided we needed Starbucks. An icy cold tall Mocha Coconut Frappaccino (with soy-milk, hold the whip) for me, and a grande hot chocolate (with whip) for Mark. Of course, we justified the consumption of these high Calorie high sugar treats with the fact that we would be running 42.2km on Sunday morning. Clearly we need the Calories. Ha! Our bellies now full of carbs and sugars and Calories, we headed to pick up our race kits and wander the pre-race expo. As per usual, the pre-race expo included free samples of various gels, running gummies, and energy bars, information on other races, and places to buy new running gear. A runner’s Mecca if you will. 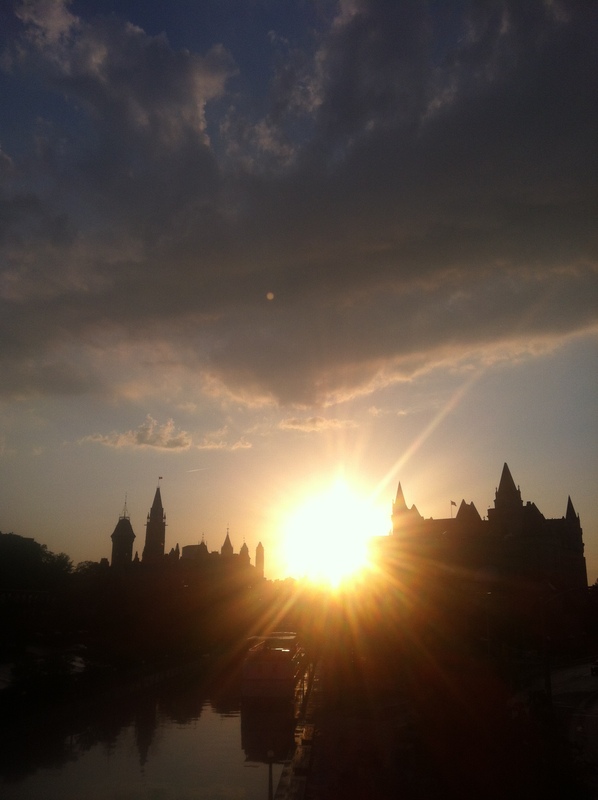 Sun setting behind parliament. A great way to end the day. Eventually we made our way to dinner – pasta and a beer of course. By the end, I was stuffed. Painfully stuffed. To be honest, I’m still stuffed (hours later). But it’s all for a good cause, right? And I need to keep reminding myself that I need the energy. We ended the day by taking a walk around parliament and down to the river so that we could watch the sun set, and then returned to the hotel to chat and relax. After all, we are supposed to be taking it easy so that we are in prime form when the gun goes off on Sunday morning. Anyway, tomorrow is another day to relax and fill my gullet with carbo-treats. Which means I should get to bed so that I’m rested for my day of gluttony and sloth. Gluttony and sloth, two of the seven deadly sins, or the best pre-marathon game-plan ever? Something to ponder. 1 My trek also included a bus ride thanks to the Via Rail strike. Truth be told, the bus ride wasn’t too bad as it was only one hour long. However, the larger than average dude that sat next to me took up more real estate than I was comfortable with. I pretended not to notice, and instead focused on napping and watching Game of Thrones on my computer. 2 There’s something to be said for first class – lots of leg room, lots of service, and plenty of extras, such as chocolate3 and wine4.